The US economy has been tough for the past few years, and the US dollar has lost a lot of ground against the Euro and other currencies. This translates to higher costs for most commodities, including wine. Some of my favorite wines are from the Rhone region of France. Chateneauf du Pape, Cornas, Gigondas are just some of the styles I love. While shopping for these wines late last year, my salesperson told me to look through the catalog for some of the older vintages that they still had in stock. I was amazed at how much cheaper I could buy some of these older vintages versus the new releases. Instead of purchasing the new vintage of Chateauneuf du Pape, I opted to stock up on the better producers for the years 1998 through 2003. The retailer bought these wines years ago at a price significantly lower then the new vintage. Many retailers have held the pricing on these wines to encourage sales and to deplete their inventory. This offers an opportunity for wine lovers to grab a real bargain. Why wouldn’t you consider buying past vintages of quality winemakers? The wine has had some time to develop in the bottle possibly improving in character. Most often the tannins soften providing a better drinking experience. Most importantly, you can save a few dollars allowing you to buy better wine for the same price. In every city you can find a retailer that has past vintages stored in a temperature controlled warehouse. Many have on-line catalogs that allow you to peruse what wines and vintages are available. In Washington, DC, I buy from McArthur Beverage http://www.bassins.com/, Calvert Woodley – http://www.wineaccess.com/ and Schneiders – http://www.cellar.com/ . All of these stores have past vintages that are available to purchase. If you are not in the DC area, check the larger stores in your specific area to see if they have a web presence. You can also inquire with the stores directly regarding availability of past vintages. Good luck, and let me know what bargains you find! I will share them in a future article. I am still reeling from the fabulous tasting I attended a few weekends ago on Gibson Island, outside of Baltimore. John Larchet, the owner of "The Australian Premium Wine Collection" led me through all of his wines over two eight hour days. I have to thank John, as it was one of the best wine experiences I have ever had. One of the brands he represents in the United States is Hewitson. Based in the Barossa Valley of Australia, they produce 11 different wines. I tasted six of them, and loved them all. Dean Hewitson and his wife Lou founded Hewitson in 1998. In a short time they have made a name for themselves and their wines in the Barossa Valley. "Miss Harry" is named in honor of their daughter Harriet. A classic blend of Granache, Shiraz and Mouvedre (GSM for short), this wine is an easy drinking gem. It pours a medium red/ruby color. There are flowers, berry and anise on the nose. This wine is very fragrant and medium bodied. When tasted, the black fruit, black cherry and plum are first to be noticed. The flavours transition to red fruit like strawberry and raspberry on the medium length finish. The tannins are soft and pure and well balanced. This is a beautifully crafted wine. This is a versatile wine to drink on its own, or with food. For the money, it is a stunner. I went on-line and found the 2005 vintage of this wine for less then $20 a bottle. I immediately bought a case. Don't miss out on this one. I am rarely as confident of a wine as I am of this one. I defy you NOT to like it. 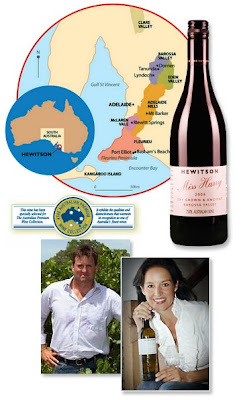 You can check out the Hewitson website on line at www.hewitson.com.au. Check out the 2005 vintage of "Miss Harry" currently on sale for $17.98 a bottle at Wine Library in New Jersey. Shipping is approximately $25 per case. This puts your per bottle cost at around $20. Don't miss out. With the dollar in free fall, the 2006 vintage will be at least 20% more. Chateau Montelena was sold today to the French Estate Chateau Cos d'Estornel. The price of this deal is unclear, but according to the Wine Spectator, Montelena fielded offers between $120 and $150 million for this Napa winery and vineyards. Some of my colleagues reacted with disgust as I shared the news with them. For the US to be selling out to the French...it was so....unpatriotic! I disagree. This is not the first major winegrower to sell out to a European wine house. Last year Stags Leap Winery was sold for $185 million and Duckhorn for $250 million or more. This is the start of a trend. Montelena and Stags Leap wines emerged well ahead of all other US winemakers in 1976. There was a competitive wine tasting in Paris, now referred to as "the Judgement of Paris" where French judges named Chateau Montelena's 1973 Chardonnay as superior to all of the hallowed French Burgundy producers. Everyone was shocked, the French unpleasantly so and the Americans ecstatic. This put American wines on the map. This is such a compelling story that Hollywood took notice. 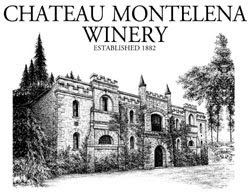 In January, during the Sundance Film Festival, "Bottle Shock" was premiered telling the Montelena story. There have been some notions that "Bottle Shock" will increase Montana's profile in the same way that the movie "Sideways" did for Pinot Noir. Although not yet released in theatres, you can bet that Cos d'Estornel will be more then willing to fund its distribution. The more important economic issue here has nothing to do with our domestic wine gems being sold. It has to do with America's addiction to borrowing. We have long been the worst savers in the world. Our economic growth and innovation has allowed us to stay on top for a very long time. The global economy though, is starting to catch up. The dollar, long the benchmark currency in the world, is being supplanted by the Euro. The dollar and all assets valued in dollars are down right cheap. Lets just say that America is "On Sale". Just last week we saw Anheuser -Busch, parent company of the iconic American "Budweiser" brand, sold to the Belgian brewer Ambev. These deals are only the first of many American brands that will be sold. We have to change our culture in the United States from spend to save. Our complaints regarding the price of oil, gold and other commodities are falling on deaf ears outside of the US. The dollar is no longer the currency of choice. For my part, I am going to continue to find wines that provide superior value and quality. The wines are out there and the winemakers are looking to be discovered. I am going to pass on the big name wines for which we pay for reputation more then substance. I would encourage all of you to do the same. 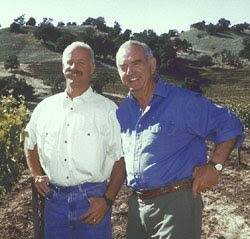 Congratulations to Jim and Bo Barrett, owners of Chateau Montelena and America's newest multi-millionaires! I love Red Wine. In the summer though, it can be a bit too hot for a structured, heavy red. When cutting my teeth on wine in the early 1980's, I was introduced to German Rieslings. I LOVED them. With varieties ranging from slightly sweet and refreshing to almost candy like, the German Rieslings were a great introduction to wine. Easy to drink, affordable, and always readily available. I learned a lot about German Riesling during this period of my life. As my tastes became more sophisticated, I transitioned to red wines, and sadly, never looked back. Two wonderful friends and wine experts introduced me to this wine and re-introduced me to Riesling. Although not German, this Riesling radically changed my perception of this noble grape. Pikes Estate is located in the Clare Valley of Australia. Although mostly known for its Shiraz, it is also famous for its "bone-dry" (Read - Not Sweet) Rieslings. I was flabbergasted when I tasted this wine. Instead of slightly sweet, it was remarkably refreshing and completely different then I expected. I would have never guessed in a blind tasting that this was a Riesling. Wow, this was a very exciting wine! It poured a medium straw color, almost looks like a savignon blanc. The nose of Lime zest, grapefruit and mineral was fantastic. It is intensely flavored, very dry and refreshing. The limey flavors are prevalent up front, evolving to citrus and stone fruit and mineral. It has a long, dry finish. It is VERY refreshing yet intense. This wine is beautiful. From the packaging to the price. Although many of you will balk at paying $28 retail for this wine, you need to look at the money spent as tuition. It will allow you to learn what dry Australian Riesling is all about, and dispel all previous stereotypes about this Noble grape. It is imported by John Larchet, Proprietor of "The Australian Premium Collection" http://www.tapwc.com.au/ . You will hear more about John in future posts. The collection of wines he imports is fantastic. If you can't remember the name, remember this label affixed to all the wines he imports into the states. I tasted the entire collection and did not find any I was not impressed with. This is a quality wine, and a steal for the price paid. Another little known fact....this wine will evolve and age in the bottle for up to 10 years. Why wait? This wine is delicious and refreshing now. Today it is 95 degrees with painful humidity....I can't wait to crack open an iced bottle when I get home this evening. You can find this wine on-line and at most quality retailers. You can find this wine in the DC area at Total Wines and More in Virginia, Schneider's of Capitol Hill in DC and some of the better retailers in Maryland. Would you like to submit wine for review? Need assistance in purchasing wine for large events?